I just joined this community and now I realize that nobody has posted in quite a while... Is anyone still here? The Portland State University Disability Advocacy & Cultural Association is hiring three paid part-time student Coordinators. Applications are due this Friday. Position descriptions and application instructions are under the cut. So, I'm looking for information about squatting in the U.S. I have to admit that I'm really, really uninformed about the subject. Are there any articles/laws that someone could point me to? I know that Portland has a few housing co-ops, but are there any community squats in the city? Thanks for any info! The foodstamp program covers seeds and plant starts for home gardening. However, finding a place that sells these isn't easy. Nurseries and garden centers that I've called are not setup for accepting that type of payments, and the farmer's market is not yet open for the season. Very limited seeds are available through local grocery stores, but in searching through those I've only found a fraction of the different types of seeds that I want to plant. I don't have any seeds to exchange, because this is my first year getting started with a home garden so seed-sharing groups aren't going to be very helpful. Does anyone know of anyplace in the portland/metro area (preferably westside) that sells seeds and plant starts, accepts foodstamps, and carries a decent variety of edibles? Come play, draw on, and manipulate the art! My partner and I will be heading that way in late march and have almost everything set up and rearing to go. Housing has gotten us stumped (not unlike almost everyone relocating to PDX ). We're looking for a one or two bedroom one level house or first level apt (or with an elevator) to rent. Simple, affordable, queer and pet friendly housing. Where are you hiding it? x-posted to poorinpdx, queerportland, damnportlanders. A lot of events including the LOTR Trilogy on a 'big' screen. Most of a day's entertainment in exchange for a donating a few cans of food. Saturday January 17th, starting at 11:00 a.m. 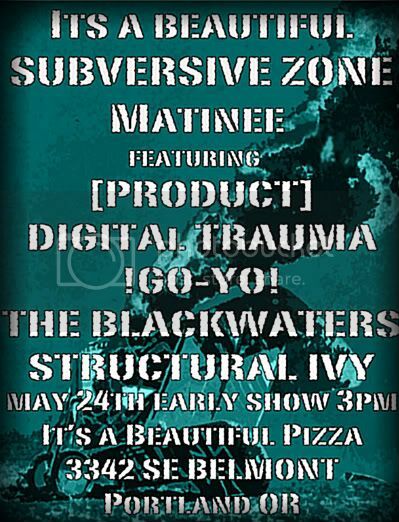 The Last Subversive Zone at Mt. Tabor Legacy! !FREE! July 24th! The Subversive Zone is a collective. 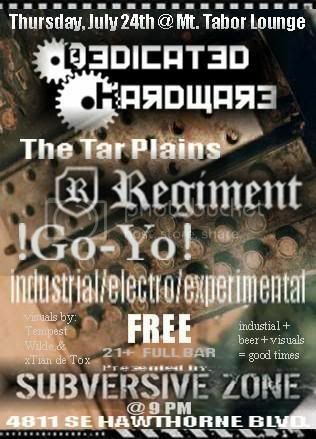 A community of artists pushing the envelope of high tech musical creativity gathering on the 2nd and 4th Thursdays of each month. blackrose books + freestore has a metric tushyload of free clothes. shirts, pants, shoes, skirts, coats, sweaters, shoes, and some non-clothes stuffs: books, dishes, scrap fabric, and moreeeeee. oh, and right now we have SOOOOOO MUCH clothes traditionally worn by women. SOOO MUCH. most everything is in new condition. or barely worn at least. so, yes, please come get free stuff. 4038 n. mississippi. open 12-8, seven days a week. 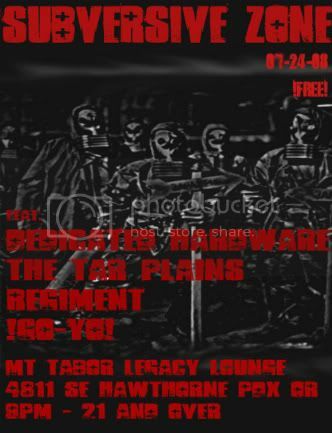 So,if you have nothing else to do,come on out and support some local music,yo!! Win a change at a $50 gift card to Target! If you have any questions you can also just comment here. If this is inappropriate for this community, I am sorry and don't mind it being removed. 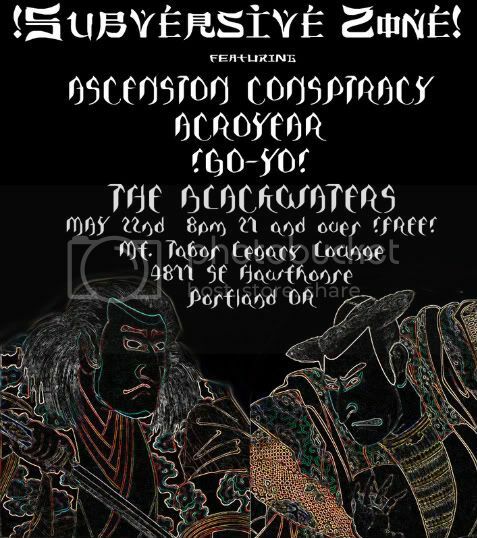 This show is going to be a FREE event, but we need the help of artists and Performers to make it exciting! Toys make everyone happy, they rekindle the experiences of our childhood. What is your artwork that is related to toys? Toy Art can be anything toy themed. Bicycles, puppets, sculpture, pinatas, dolls, games, fashion, robots, and more encouraged. * We welcome a variety of medium (photography, digital, illustration, collage, mix media, painting. sculpture...) There are no restrictions on size. * Up to 5 images will be considered for the exhibition. Images must be in jpeg format. Posted to the Toy Art Show 2008 on flickr. * The deadline for Submissions is Sunday May 11th, I understand that being creativity and procrastination go hand in hand sometimes so if you have an idea that you plan on getting done by the show June 6th let me know, and I may be able to hold a spot for you. 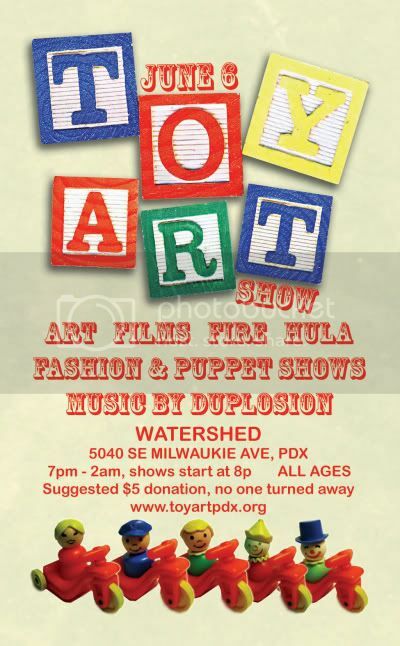 * The Show is June 6th @ Watershed please come celebrate toys with us! 2. To add a photo to the group, select the photo in your account you will see options for adding the photo to the group directly above the photo. 3. Please DO NOT submit more than 5 images. 4. We will be contacting you through your flickr mail account, so please check that account. olden days, when pot was a cooking utensil, webs were for spiders and civil rights were for white folks." She tells stories all mothers can relate to. Stories like taking her four children all under the age of eight to the 5-and-10 (the five and dime) three days before Christmas and 5-year-old Ginger having a break down in the store because she spent all her money and forgot to buy her daddy a present. She peppers her stories with reminders of the special problems that blacks faced. She ends the Christmas story with a lament about having to walk past Woolworths during the Civil Rights era when the store was being picketed for because they would not serve blacks at their lunch counters in the South. She states "but pass it up I did. This was bigger than my pockets. These young people were bigger than me---and I couldn't let them down." The event is free and I think light refreshments will be served. Brunch by donation Sunday morning with TOTAL LACK OF TALENT show - come show off your cracked out selves in the morning! I have a friend at work that is looking for inexpensive birthday party ideas for a three year old. I thought I'd go ahead and ask here to see if some of you know of anything offhand? She might consider a McDonald's party (although we're not sure how much those cost) and doesn't want to do Chuck E Cheese.